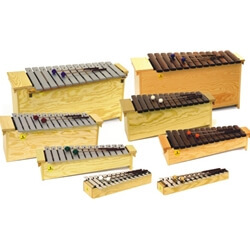 This set features Grillodur (fiberglass) bars on the xylophones, which are an excellent option where climate is a concern. Extreme temperature and/or humidity conditions can sometimes cause intonation or other consistency issues with wood bars. Grillodur remains stable. Please note: the photo shows the regular wooden bars. Grillodur bars have a lighter appearance.